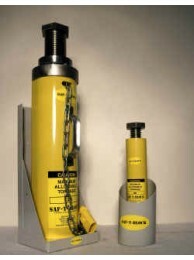 Designed to prevent damage to safety press block that might reduce effective tonnage rating. These caps are strongly recommended on top and bottom. Used to fill the gap between the safety press block and the upper slide (RAM). Aluminum is the most durable and much preferred, though hardwood is available. 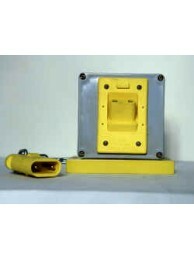 Provides a safe method of handling safety press block. Two handles are highly recommended for longer blocks and heavyweight adjustable models. In storage When the safety block is stored on the side of the press with the safety plug connected to the control circuit, the press is operative. In use When the safety block is in the press bed area with the safety plug disconnected from the control circuit, the press is inoperative. This system complies with OSHA Energy and CSA lockout regulations. Safety press block holder provides a safe, designated place near electrical connection. It is available for all our safety press blocks, including any accessories. Rubber retention strap in included. Pair of Aluminum Wedges with Chain used to fill the gap between the safety press block and.. Complete Set of Yellow Male/Female Power Cutoff, 2-Prong with Chain. In storage: When the safe.. Female Power Cutoff - 2-Prong. In storage: When the safety block is stored on the side of the .. Male Power Cutoff - 2-Prong with Chain. In storage: When the safety block is stored on th.. 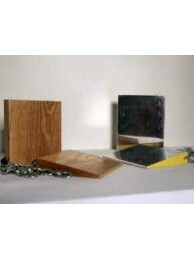 Pair of Wood Wedges with Chain used to fill the gap between the safety press block and the uppe..
Steel Holder to accept the Saf-T-Block. Designed to easily attach to the machine with standard..